I have to admit – I had a tough time putting this challenge together. Runway looks typically focus on the style and cut. It’s not always easy to replicate those extraordinary looks using everyday pieces. The challenge was even more difficult for me since half of my stuff is still in the storage. Although, I was determined not to buy anything new and use what I already have for this challenge. After hours of scouring the internet for inspiration, I've decided to recreate a look as seen on the Marc Jacobs SS 2013 runway. 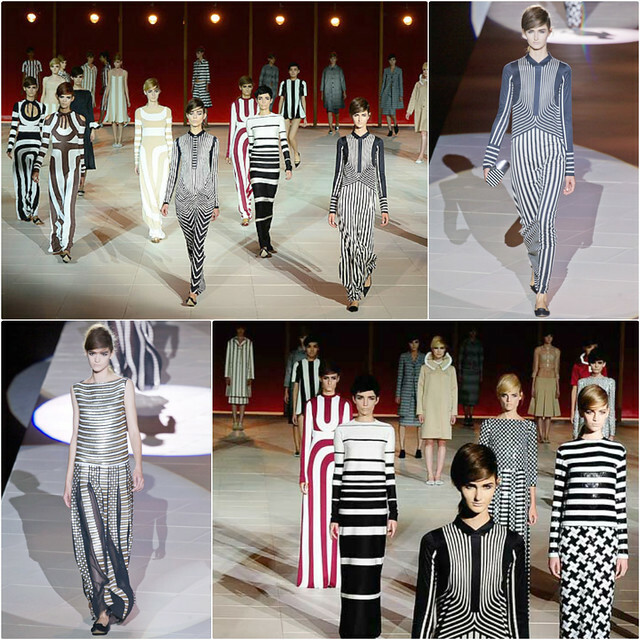 With the use of stripes and patterns in black and white, the collection was incredible. While everyone was going for a pop of color, he did a marvelous job making basic colors looking amazing. You can watch the entire show here. To stay true to the inspired look, I created this outfit using stripes/patterns in black and white. This look is simple, chic and totally wearable. I hope you enjoy this post and I can’t wait to check out everyone’s entries. If you’re interested in hosting next month’s PFC, please sign up here. I am bringing back the PFCs and hope to keep it going this time. If you are participating in this month’s challenge, please link your post below. I love the double stripes! I think you did a great job, you look so pretty! I love the mixing of the stripes. Great job, Sydney! I wish I could join PFC this time around, but I've been quite busy. wow you did a fab job Sydney! @kileen Thanks for participating, Kileen! You are a definite winner of this challenge - you executed this look perfectly with the two different types of stripes! Hi Sydney!! DId you just get a new Chanel??!!! Ok im definitely jealous! i love your photos on IG. I know I need to blog more. Work has been really busy but im putting my two weeks in soon actually. :D Im looking forward to some free time. Hope you have a great week and you look fabulous like always!! So fun! What a great take on this runway look. I know you said it was hard to put this look together, but you seriously look awesome. I totally think you nailed the look. I LOVE stripes on stripes. I love that it is all over the runways, but it is also simple enough to wear in real life. You look great! @simplyvonne Hi Yvonne. I got this one last year but didn't get to wear it that much. Definitely keep us posted on your career. This is a perfect runway project. It's chic and wearable. Oh I love this runway inspired look!!!! You did a great job putting it together. You totally fit on that runway too :) Love the purse! This outfit is cute! I love how you style the mixture of patterns in one outfit. Very cute inspired outfit! Love the different stripes and those booties! Hope the PFC is well-attended!